231s, Graphic EQ from dbx. dbx has enhanced its product line with new versions of its graphic equalizers, compressors and crossovers. The dbx S Series products feature a platinum front panel, and four color packaging with informative application suggestions for each product. 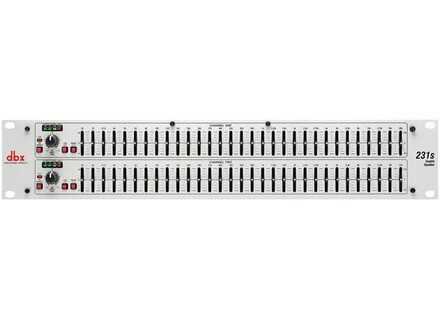 The dbx 231s dual 31-band, 215s dual 15-band and 131s single 31-band graphic equalizers each offer 1/3-octave constant Q equalization with switchable boost/cut ranges of ±6 or ±12dB, with a ±12dB input gain range. The 231s, 215s and 131s all feature 4-segment LED ladder meters that provide indication of output levels, and they feature 20mm nonconductive sliders. All models have XLR and 1/4-inch TRS inputs and outputs, and are designed to offer a frequency response of <10Hz to >50kHz with greater than 108dB dynamic range. The 266xs compressor/gate and 166xs compressor/limiter/gate both offer dbx AutoDynamic scalable program-dependent attack and release controls that adjust the actual attack and release times to match the program material. The 266xs and 166xs are also designed to enable classic "hard-knee" compression, and allow users to manually adjust threshold, ratio, attack, release and output gain. The 266xs and 166xs can be used in stereo or dual-mono mode, and include balanced inputs and outputs with XLR and 1/4-inch TRS connectors, along with a TRS sidechain insert. The dbx 234s/234xs stereo 2/way/mono 3-way/mono 4/way crossover and 223s/223xs stereo 2-way/mono 3-way crossover both utilize Linkwitz-Riley filters to separate the audio signal and direct the correct frequencies to the loudspeaker drivers. The dual-channel 234s/234xs and 223s/223xs are designed to offer independent output gain controls for level matching, output phase inversion, a 40Hz low-cut filter, selectable stereo/mono operation. The 234s and 223s feature 1/4-inch TRS inputs and outputs, while the 234xs and 223xs provide XLR connections. Check out dbx for more details. Cadac Electronics DM1600 Cadac is launching a new digital console at this year’s prolight+sound/MusikMesse. Studiomaster Digilive 16 Studiomaster is launching new products at this year’s Prolight+Sound/MusikMesse exhibition in Frankfurt, Germany, including the Digilive 16 live digital mixer.